In Part-1 I mentioned how unpredictable the action is in rodeo making its photography especially challenging compared to motor sports. Because of this my technical approach is markedly different doing rodeo vs. motorsports photography. All of my camera settings are just he opposite in these two action genres! Motor sports ~ 1/30th sec., to 1/250 sec. Because there’s nothing quite so boring as a race car or motorcycle frozen in place on a race track, using a high shutter speed, making the race track look like a parking lot, I rarely used very high shutter speeds. So, to imply great speed I used SLOW shutter speeds (eg. 1/30th - 1/60th sec.) and panned my camera, tracking the action, creating nice streaks in the background. The slow shutter speeds also made the wheels blur completely adding to the sensation of speed. On motorcycles the spokes disappeared rendering their wheels so clear you could see the background through them. This applies to prop driven aircraft as well. The one mistake that many amateurs make when photographing propeller aircraft is using a shutter speed that stops the propellers! After all, aircraft when taxiing on the ground are very static—the only things that are creating action are the propellers. So, I’m usually using 1/60th sec to create nice blurred propellers. Rodeo ~ 1/1000 sec., to 1/5000sec. Nothing in rodeo moves anywhere near as fast as any serious motorsport and yet ironically I use consistently much higher shutter speeds in rodeo action because its action tends to be very short bursts of extreme action at very unpredictable moments. In addition, unlike motorsports, when we freeze the action in rodeo it often gets more interesting to see the complex elements exploding into action that we can’t see in real time. I start at 1/2000 sec. 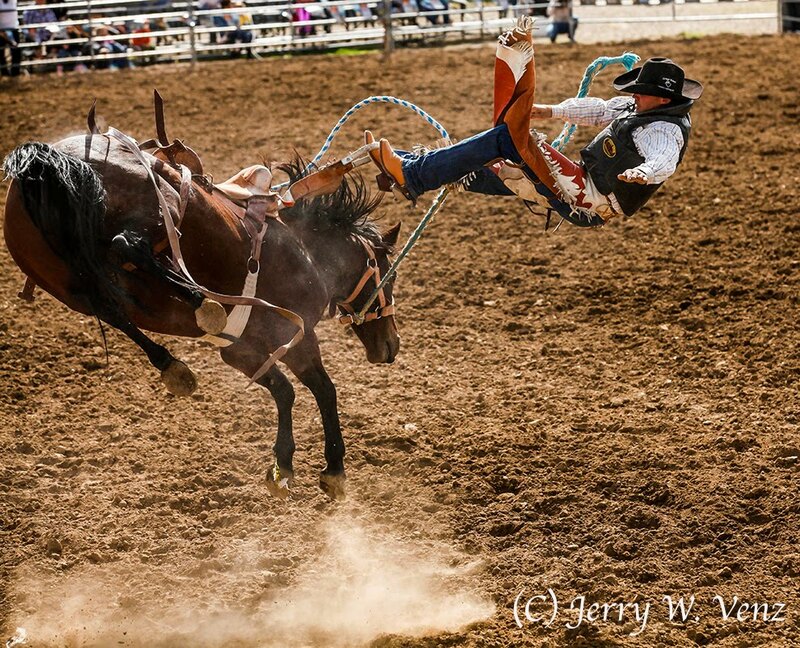 for most rodeo events, but even that shutter speed will not stop the extremely violent action in some events like the saddle bronc rider, above, being ejected off his mount. This one though at 1/5000 sec. has all the action stopped showing everything in sharp detail. When doing action pans at slow shutter speeds the f-stop must go to smaller apertures to maintain proper exposures. Another benefit to those slow shutter speeds is that even with the increased depth of field created by these small apertures—which could otherwise ruin the image by showing too much detail in the background—the panning action blurs out all that unwanted detail. Today I can confidently use any ISO I need to get me to the shutter speed—f-stop combination I require to get the shot. This is one of my favorite rodeo images because it captures in one frame the whole story behind team roping; probably the most difficult rodeo event to photograph. The reason I got this image is because I chose to place myself in the announcer’s booth—a nice elevated platform to eliminate some of the stadium background—so that when the "header" lassoed the steer I knew that he would turn his horse towards me to stop the steer’s forward progress and expose the steer’s hind quarters so the "heeler" could lasso the steer's rear legs. With them turning towards me, as a group, it compressed the composition keeping all of the action in frame. Camera placement is important in ALL photography, but I’ve found that in rodeo it’s critical all the time. 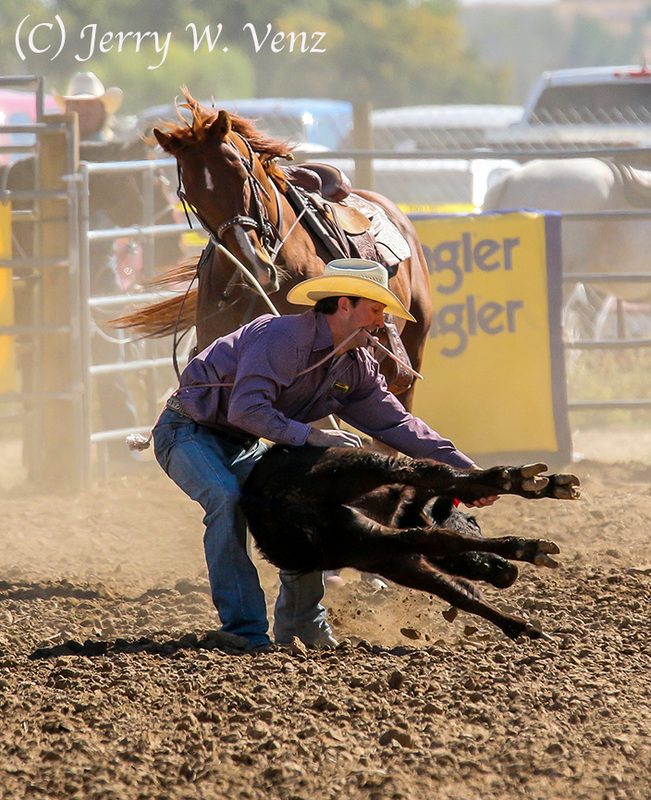 In this event the calf is released, giving it a head start, before the mounted cowboy is allowed to pursue in his attempt to rope, bring down, and tie the calf. So this creates a large space between the cowboy’s horse—that stops after the lasso has connected with the calf and, as the cowboy jumps off the horse to tie the calf, the horse will keep the rope taught (the horse will actually back-up to do this!) while the cowboy runs towards the calf. Compositionally as seen from the side this is just too wide a grouping, so I chose to face the action, as it comes towards me, from across the arena, and compress the action with my lens at 280mm. I’ve been using the Canon 5D MkII and the Canon 70D with great success even though these are not considered professional action platforms. I’ve found that they perform well when the auto focus is set to the Ai Servo Mode. Both follow action well when doing action sequences at high frame rates. My main lens is the Canon 70-200 f2.8 lens. I’ll add the Canon 1.4X extender when needed. 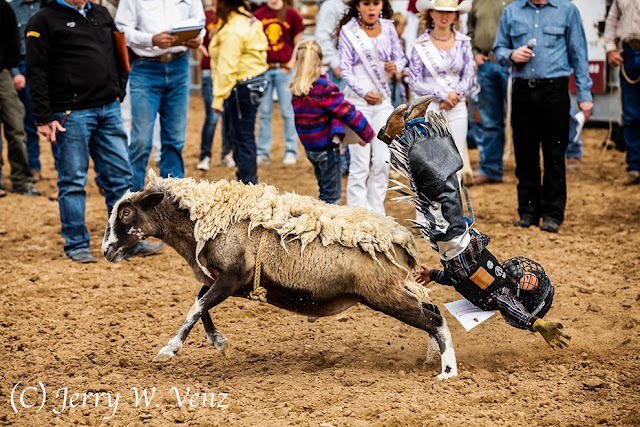 As a former motorsports photographer let me say this, rodeos are a challenge! 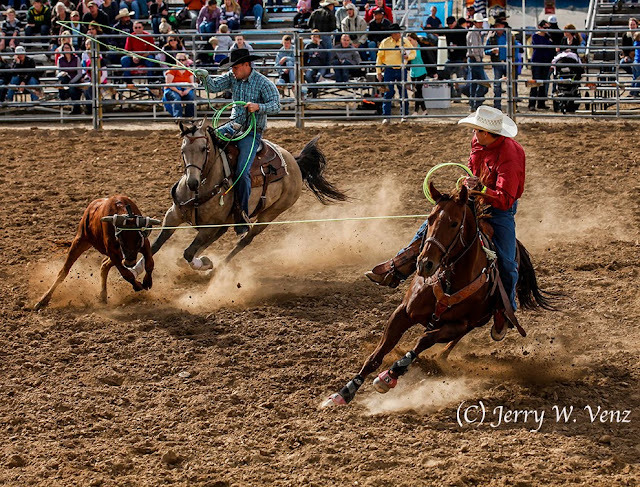 I’ve only photographed a few rodeos since moving to Idaho, and they’re a real kick, but having photographed everything from motocross to warbirds, top fuel dragsters, Indy cars, Grand Prix Motorcycles, and professional AMA, half-mile and mile, flat track motorcycles, all fast moving sports, the big difference in rodeo photography that makes it such a challenge is its utter chaos! The cowboys and cowgirls in most rodeo events aren’t “driving” something from point A to B and repeating like a motorsport racer does on a track. I always know where a motorsports racer is going—they start here and finish there and lap after lap the pros hit the same line through turns within inches of their previous laps. I can plan my shots and get great images all day long. 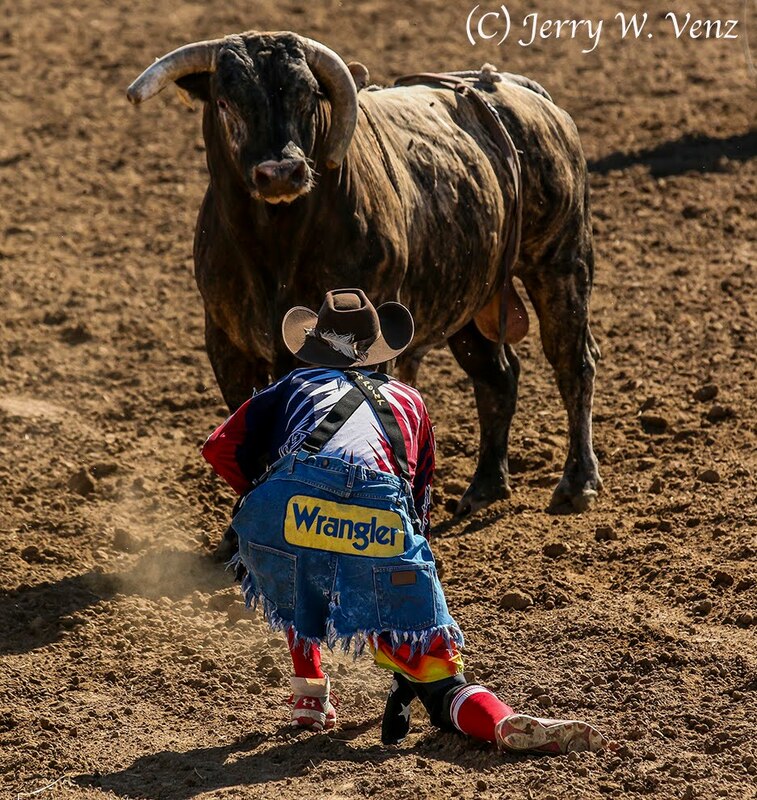 But, in this sport, these cowboys are just along for the ride on these crazed bulls and broncs! Nobody knows where these animals will go or what they’ll do at any point once the gate is thrown open. 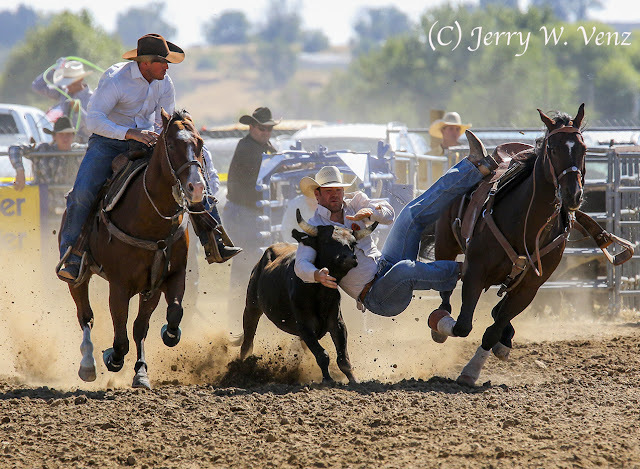 One of the rodeo events they do manage pretty well is steer wrestling where the cowboy leaps off a perfectly good horse, at full gallup, onto a steer and wrestles it to the ground! The one bit of control they attempt here is having another rider bracket the steer to keep the animal moving in a straight line between the horses—it usually works! This event is easy to photograph from the front—you just need a long lens and a high shutter speed. 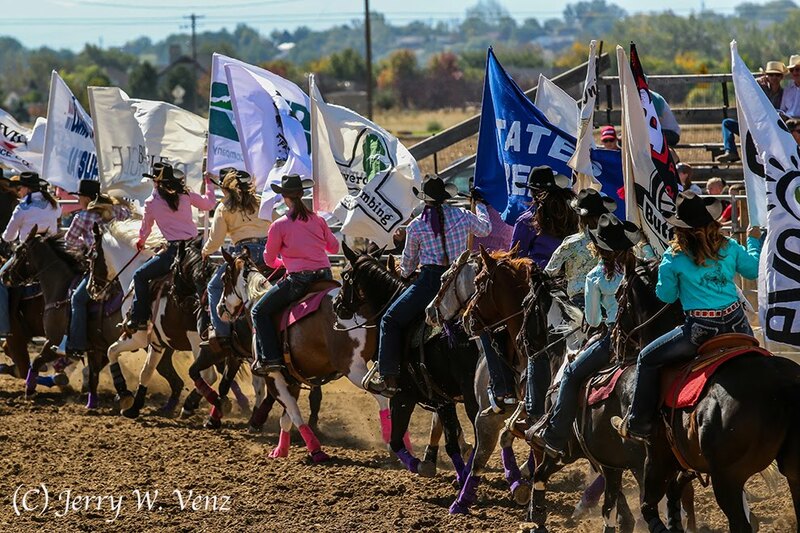 I always get them coming and going so that I get clear images of those flags for inclusion in the following year’s rodeo program. This kid lasted about 4 seconds…I love the expressions on the two girls in the background! It’s a great introduction and training for the future, bronc busting, bull riding champions. Don’t know who has the bigger “pair” in this standoff, it may be a draw! So, when the second bull was released I was already back pedaling when I saw this bull was a “spinner” and launched its rider very quickly. In the next instant, still spinning, I saw the bull closing on the other photographer and fortunately he wasn’t hit by the sharp end of the bull when he was slammed into the arena fence! After that I left the arena for the higher safer, ground of the announcer’s platform. That turned out to be the best decision I made since, not only was it safer, but that elevated position gave me a great high angle down view that eliminated a lot of the ever present crowd filled bleachers that mar most rodeo photography. My goal in most outdoor photography is to get a clean background. Being elevated gave me more of the arena’s dirt as a background, which is a huge improvement over the arena’s fence and all those bleachers. In Part-1 I talked a lot about the ideal outdoor location. I said, “Know Your Locations!” You must know how to use them and when to use them. 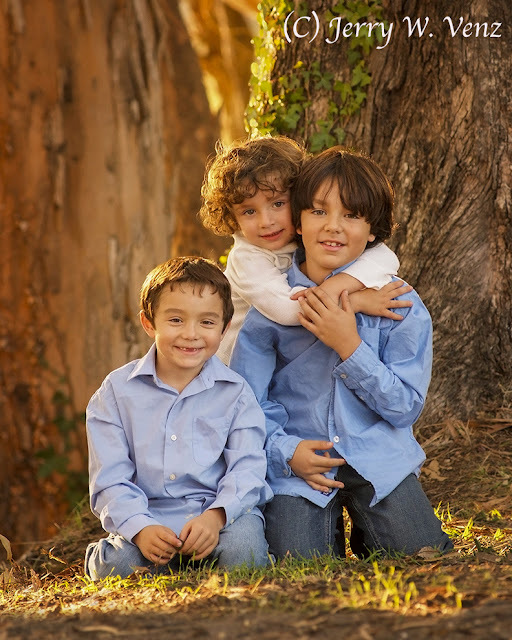 Knowing this helps you be not only creative, but efficient on your session because when you’re doing portraits of families with children the clock is ticking. I’ve found that about an hour is all I’ve got to do the complete family portrait before the kids melt down! Always start with the largest group set-up especially if there are small children involved. Do the largest group set-up in at least one other spot within your location. Make it look different—a change of background and a different pose. If you give them a choice sales are usually better. Show them the results of each set-up. The back of your camera is step one in the sales process. If your camera can’t produce a gorgeous jpeg image on its back screen—get a camera that will and/or get control of your exposure and white balance. Always do a Custom White Balance! I’ve placed them in the shade, so the color temperature is very cool there compared to the background with its warm, setting sun, back light. 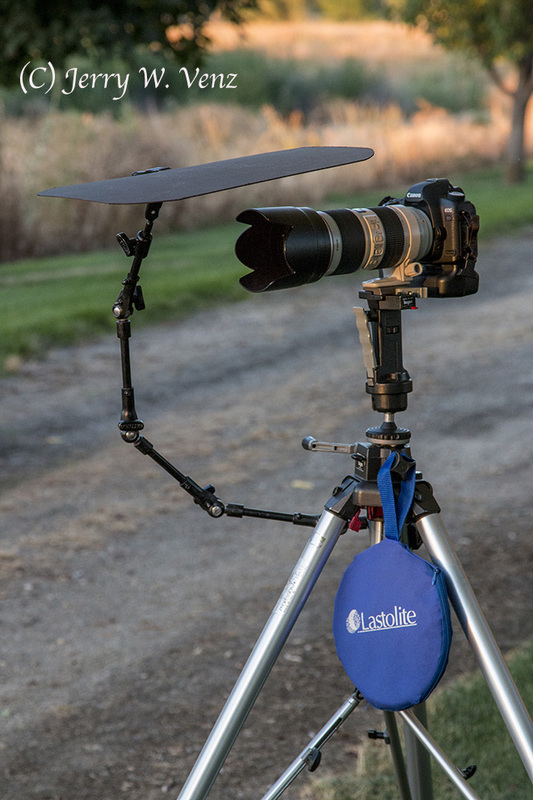 I use the Last-o-Lite, 20”, collapsable unit. Its grey with a white target (so your auto-focus will lock on to it) and in a pinch it can be a gobo. I’m also placing my tripod at this time (always use a tripod on group portraits!) deciding on my focal length and f-stop. While Kathi is fine tuning the group pose I focus on the face of the nearest person to my camera. I use auto-focus and then switch to Manual Focus Mode on the lens to Lock Focus. Then I do a test exposure of the group—zooming in on my camera’s rear screen to check the closest and farthest face for sharpness. I also turn the image stabilizer OFF on the lens while on the tripod. This was taken at one of my ideal locations where the sun is setting behind them and there are several trees at camera left blocking the sky light (acting as a Gobo—using Subtractive Lighting) At camera right I have a nice Large piece of sky (the sky is my soft box!) as the Key Light. When I use the location; this was done two-hours before sunset. Usually I’m doing portraits closer to one-hour before sunset, but in this location there is a mountain behind them that totally blocks the sun—killing my backlight—at my usual start time. This is why you must know your location. Where I place my group; This is absolutely critical! Remember the maxim taught by the great Leon Kennamer, “TheLight is at the Edge of the Forrest.” (see Part-1) With that always in my mind I know that I can’t place a group directly under the tree’s canopy (I’m not wanting total shade—that just gives me Flat Light, Yuck!). So, I place them at the front edge of the canopy so that I can see the sky light on All their faces creating nice directional lighting—with shadows! This is True Natural Light Portraiture. NOTE: Being locked down on a tripod fixes my distance thus keeping the perspective the same because my focal length is now, fixed as well. This makes it really easy for Kathi when she does the inevitable head swaps later. Here’s my portrait rig…. My workhorse Canon 5D MKII with the best portrait lens made, the 70-200mm f2.8, on my Bogen tripod with grip-arm and flag over the lens to block lens flare. The Last-o-Lite—white balance and gobo is always with me. 9) Meanwhile, as I go back to the camera, Kathi usually finesses their pose; doing final hand placements and keeping heads apart so no two heads are stacked over each other; maybe adjusting one of the gals hair. Then she gets out our squeaker toy and gets silly while I start my exposures. 10) After we’ve done this in a couple or three spots I do a group portrait of just the kids. Important: I have the parents stand back by me, at the camera, for these images and ask for their assistance. Otherwise, if I allow the parents to stand off to the side usually closer to their kids than I am, the kids will look at them, as they take pictures with their cameras, instead of looking at me. 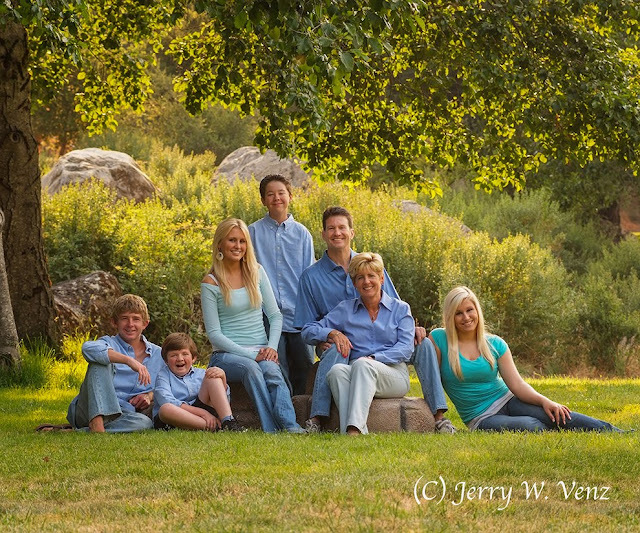 With the parents at my camera position, which is usually farther away (I like to use my lens at 135-150mm for group portraits) their kids are looking at MY camera and the images the parents may get with their cameras wide angle lens are of a tiny, little, group far away! A nice children’s group portrait…. This is a great example of a parent following our clothing consultation guidelines (see Part-2). Because she had them in SOLID Colors (no stripes or patterns)—in this case shades of blue—the colors translated nicely into sheds of grey for my B&W conversion. This way your eyes go to their faces in the portrait. And, hats off to Kathi for this marvelous pose! Its really hard to get kids to even touch—and with all their heads close together. They have really nice hand placement as well; Nice. 11) Finally, I do individual portraits of the kids. 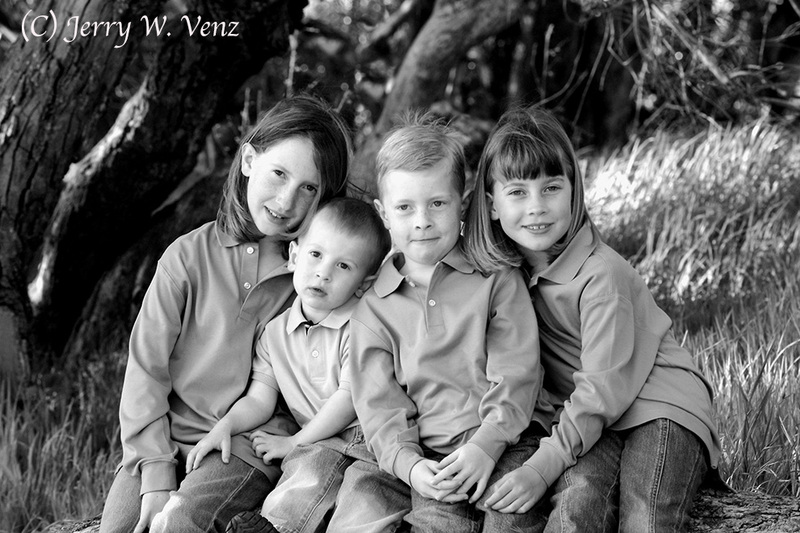 These are always money makers because I make these images look totally different than the group portraits. That’s because now I can use the best feature of my Zoom Lens—Max-Telephoto at 200mm. This is where (with a nice wide aperture) I blur out that back-lit, warm, background, creating some nice bokeh and really isolate my subject. Look at that gorgeous lighting on this boy. It’s all about subject placement and the right time of day. Why would any photographer think they could improve on true natural lighting by adding a reflector or worse flash, into a scene like this! This is why Subtractive Natural Light will always look better than any type of additive lighting when outdoors. At this point in the session I’m hand holding my camera, which is easy because I’ve opened up the aperture allowing me to use a higher shutter speed at either my usual ISO 400 or ISO 800 in this image. This lens has an excellent stabilizer as well, so I can go slower than 1/200 sec., at 200mm if I want to. 12) We’re done, usually within an hour on location, so now we reward all the kids with my favorite candy, Tootsie Pops (Please remember to ask parents if it’s OK in advance). I always bring lots of flavor choices and let them pick their own. Sometimes Mom and Dad partake as well. While I’m doing the candy handout Kathi is talking to the parents and consulting each others calendars to set-up their family portrait premier and ordering appointment. I hope this guide will help those of you who really want to improve your professional technique, produce outstanding family portraits, and make better sales! 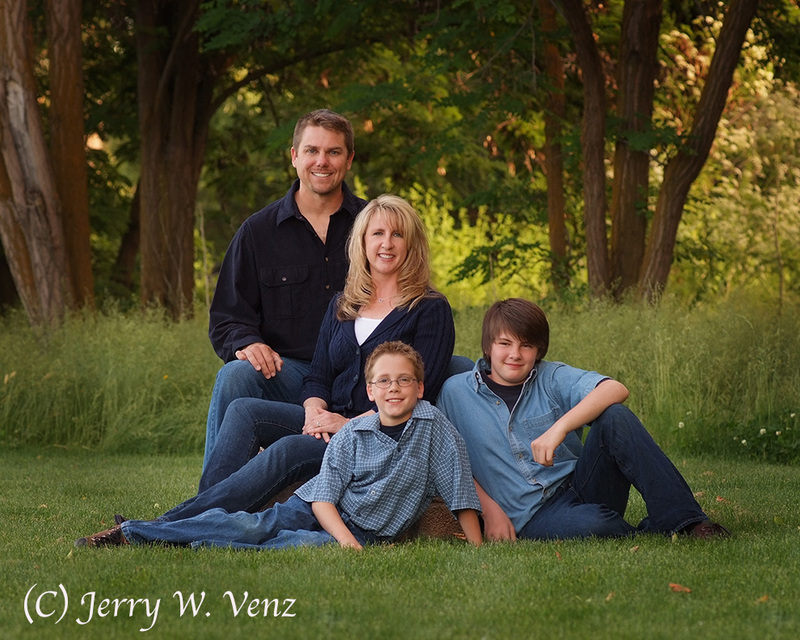 In Part 1 I talked about Finding and Using Locations for your outdoor portrait sessions. I put that first because I think it’s the most important thing that YOU actually have control of in the portrait process. How you handle your use of a location contributes to your photographic Style and Sells your work. We learned this the hard way, because at first we didn’t do clothing consultations. Then when we started we weren’t specific enough. We learned by trial and error and that took time. Solid colors; avoid bold patterns or stripes—especially horizontal stripes. Long sleeves on adults; at least partial sleeves on children. “V” neck lines for women; avoid turtleneck sweaters as they just put weight on people. Dark shoes and SOCKS; men-no white socks! Long pants or jeans; no shorts! Week old haircuts are best. Ladies; no New hair styles. Many clients ask why we want them to wear long sleeves and long pants (even in summer). In a portrait the star of the image is the face, any other large areas of skin will draw the eye away from the face. And, unless the client is a body builder or athlete they always complain about their flabby arms or fat legs when they see their images! Then they want us to Fix Them—So, we’re also trying to save ourselves a lot of post capture work in Photoshop as well. 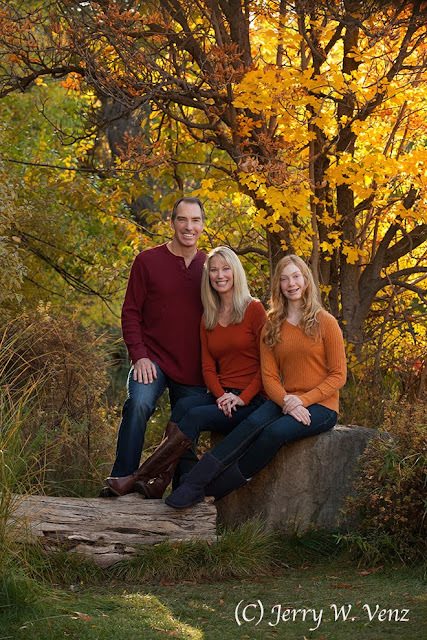 With over 25-years in the portrait business we have learned that these Seven clothing suggestions are the areas that matter the most.Our clients always like their portraits more when they follow these “rules”. If you can get your clients to follow most of these you’re half way home! The Colors we suggest; This is BIG! Using clothing colors that blend with the natural colors of a location. In our park locations, summer through fall, I will suggest: Burgundy, brown, rust, burnt orange to red. We’ve had clients use yellows with grey and browns with yellow fall colors in the background that worked as well. Within the Light Tones of a beach environment I will suggest Light Colors like taupe, tan, oatmeal or cream. Ladies can wear pastels like pink, peach, salmon, etc., This is the only environment where I will OK everyone in white clothes. 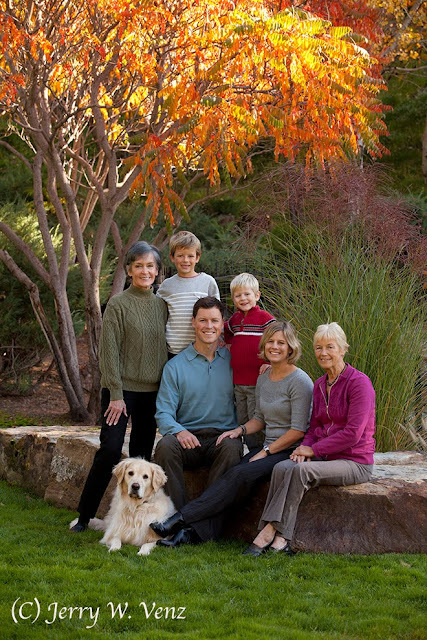 This family in the image marked PASS followed my suggestions and choose nice warm fall colors that harmonized perfectly with my location. They also heeded my advice and wore long sleeves, dark pants and dark shoes. This family in the image marked FAIL broke some of my most important rules; they have the kids in stripes and worse everyone is in a different color! At least they did have long sleeves and dark pants. Using cooler clothing colors that contrast with the colors in a location. (Usually my back-lit, warm tone—fall like—backgrounds. Here I suggest variations on blue, teal, turquoise or green; clients have used purple and lavender successfully. This client got two out of the three right. 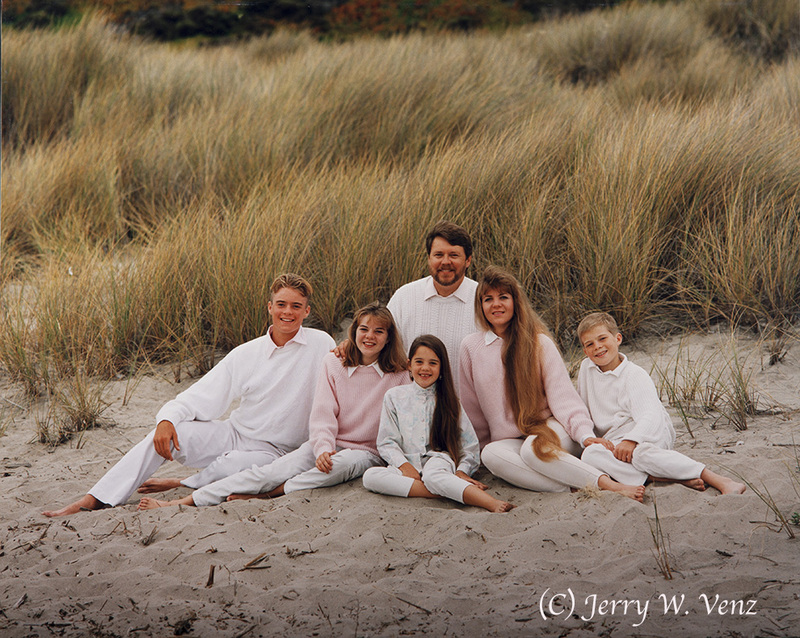 I hate it when one person in a group is wearing white—that’s the worst sin in portraiture! So, since the little brother was in white, Kathi placed him behind big brother and having him wrap his arms around his brother created a marvelous moment that their mom loved. Here, the cool blues create a nice separation off the warm toned background. 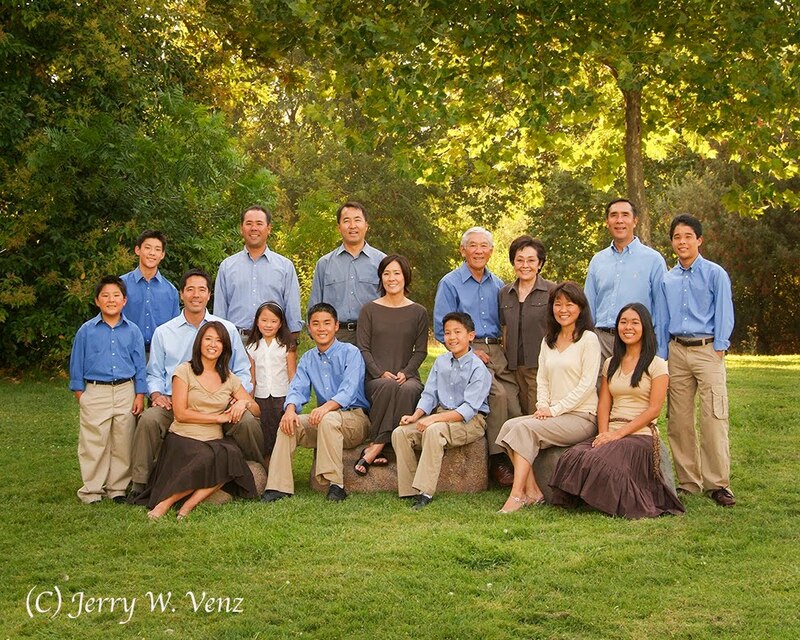 I will usually suggest that the family pick One Color from my list and vary its tone across their group. Or I will suggest that they pick Two Colors like blue and brown and then very the tones in those colors. Again, I don’t want anyone in White within a group—it’s just too bright when mixed in with other colors. We’ve even had clients complain that wearing a white shirt made their teeth look yellow! Here we have a nice cool tones/warm setting where they used my blue/brown, two-color, palette to good effect. I also dislike black shirts in my group portraits. I don’t want either extreme on a single person (white or black) that will make them be the center of attention. And, I abhor an entire group in black shirts—I think it’s creepy—too funereal. In addition you can create the look of a bunch of people wearing one giant shirt! Or in a dark setting it can look like floating heads in a black field. In Part-3 I’ll cover group placement, the pose, and some tips that will make you more productive on portrait sessions; that means you will make better sales on each session! 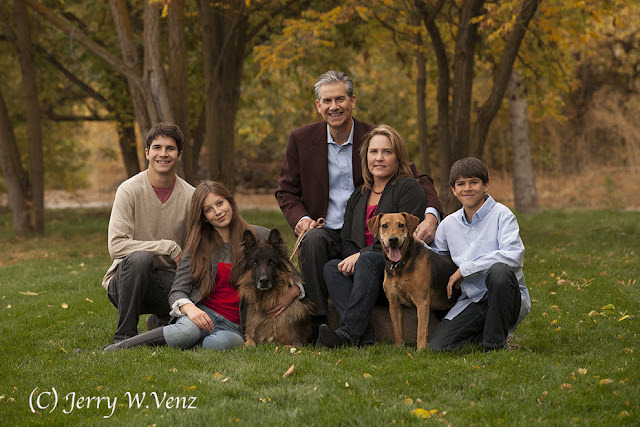 First and foremost if you don’t Love doing portraits of families, children and teens—don’t do them! Family history and milestone events like a graduating senior are too important to entrust to a photographer that is indifferent or worse to the subjects in front of them. FINDING AND USING LOCATIONS: I put this first because it’s the most important. This is my foundation: I Build The Portrait From the Background—> Forward. And that’s not all—besides providing the background—my ideal locations also create a directional lighting pattern on my subjects. 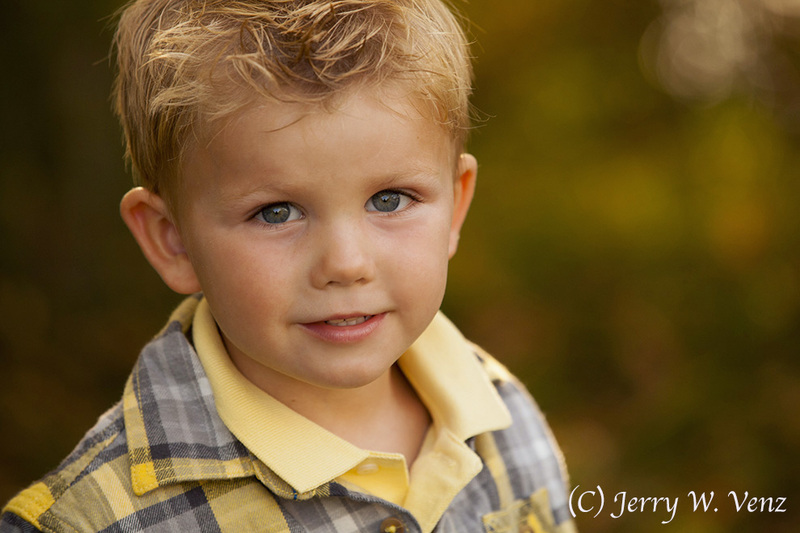 Because I place my subjects near the locations light blocking features, such as trees, rocks, bushes or buildings, which I use as negative fill; this technique, called Subtractive Lighting, and is by far the most natural of all outdoor lighting techniques. I go out about 2-hours before sunset to WALK the site I’ve chosen. You can’t just drive by, you need to get into the location! I approach from the EAST so I’m LOOKING WEST towards where the sun will be setting. I’m looking for GLOWING LEAVES being back-lit by the sun. If there’s no glow happening you may be out too early or the tree foliage may be too dense. If the foliage is too dense I don’t use the area because without back-light I’m going to have a DEAD BACKGROUND. I want my backgrounds to be glowing with light—I WANT IT ALIVE! That creates depth and visual interest AND sells Wall Portraits! Next, I pretend I’m the subject and turn my back to the background and look Right and Left. Ideally I want to see a large patch of sky on one side and some more trees on the other (to block the ambient light on the side creating some dimensional shading on my subjects faces.). If I also have a nice place to seat my subjects—like grass or some rocks-even better! The key to finding and using an outdoor location is placing your subjects at the edge of something (like a tree line) that will only allow that big patch of blue sky (the sky is my soft box) as your light source. The mantra I always use was taught to me over 20 years ago by my first teacher, Leon Kennamer, (the originator of subtractive lighting in photography.) He said that “The Light is at the Edge of the Forrest!” Which means that if you venture INTO the forrest the nice directional light turns into dull flat light coming from the top creating raccoon eyes on your subjects. The other condition that can create this effect in an otherwise great location is Full Overcast Sky; Something I try to avoid at all cost! The following two portraits, done in the same location, show the difference between the light quality of clear sky vs. overcast sky. In this family’s portrait I have my usual CLEAR BLUE SKY coming from the left, creating a beautiful light on all their faces, light in their eyes, and nice back light in the background provided by the setting sun behind them. This is how true, subtractive, natural light portraiture can look with careful placement of the subject within the location at the right time of day. With overcast sky this is the result…. Usually I would cancel a session with these conditions, but when you have family members that come into town just for the session, it is not an option. As you can see, in this overcast sky portrait the light is VERY top heavy creating dark eye sockets (raccoon eyes!) in my subjects and that the background is dark (there’s no back light) and the overall lighting is dull. Next week I’ll show and tell about the importance of clothing consultations for your clients.